A photo of a police officer that was released during yesterday's tense standoff with two armed men in Brisbane sparked a lot of confusion among social media users. 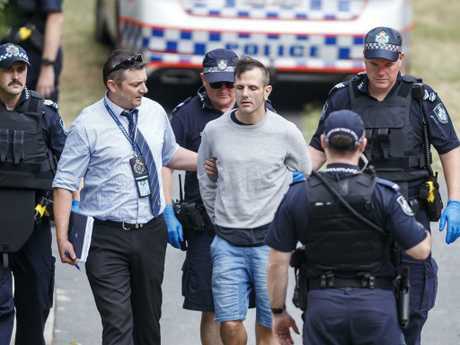 Queensland Police and members of the Special Emergency Response Team (SERT) arrested two men yesterday after they allegedly fired a shot at police and barricaded themselves inside an apartment in Auchenflower for six hours. The two men were arrested without incident before 5pm, with social media users quickly turning their attention to the unusual attire of one of the SERT officers. A photo shared to Reddit shows the officer wearing a hi-visibility shirt, cut-off cargo shorts and camouflage helmet while carrying an assault rifle. 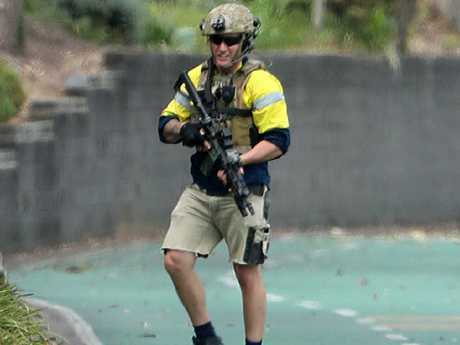 The officer was snapped guarding the bikeway along the Brisbane River. Members of SERT are trained to respond to extremely high-risk situations across the state, which is why seeing one of them seemingly dressed as a tradesman left people confused. 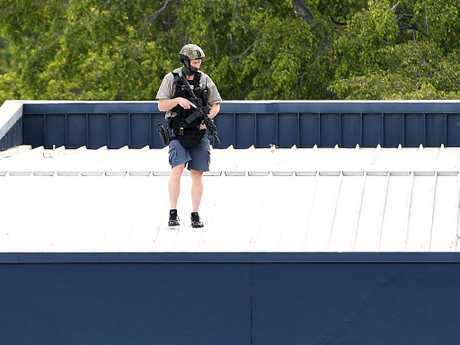 "Just looks like a scaffolder whose picked up a rifle and helmet," one person wrote. Some users theorised that he had the high-vis outfit on as a disguise to allow him to get a closer look at the suspects. Others said that the bright coloured shirt kind of defeated the purpose of wearing camouflage items. Some wondered wether it was actually more dangerous to not be wearing clothing that identifies him as an officer as people might think he was the gunman. "He doesn't look like a cop to me, no visible badge and no uniform. Just looks like a tradie with a rifle. Surely you can see how people would see this guy and assume he was the bad guy," one person said. Amid online speculation, Queensland Police has given a simple explanation for the officer's outfit. "The specialist officers who form part of the SERT in Brisbane are employed in that role on a full-time basis. Specialist officers may wear a variety of uniforms or clothing, depending on operational requirements," a spokesman told news.com.au. A spokesman reportedly told The Daily Mail: "That would just be what he was wearing when he got the call." SERT officers provide support to police operations during high-risk incidents and are used to contain threats, provide emergency tactical intervention and a safe environment for negotiators. However, in order to maintain operational security, not much is known about SERT's methods or what the members do when they are not responding to an event. 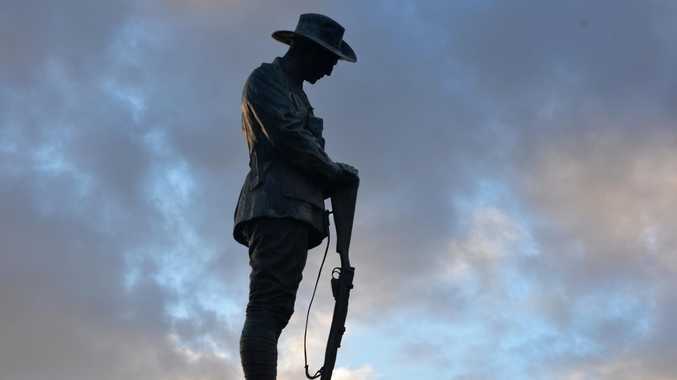 The Queensland Police have previously said this is to protect the safety of their officers. What is known about the team is that members are put through a gruelling selection process before being chosen. SERT hopefuls have to undergo a series of physical and mental tests. Two plainclothes SERT officers with machineguns near the Wesley Hospital. Picture: Liam Kidston. First they must pass an intense fitness test which includes a minimum of 10 chin-ups, 35 push-ups and 100 sit-ups. They then have to complete a 10km run in under 46 minutes and a 400m swim in under 10 minutes. All of these tests must be done consecutively without a rest period. If they pass the fitness exam they then go to the next level, which involves a brutal, three-day course that tests their mental and physical endurance. During this period, applicants are often sleep-deprived, tested on basic survival skills, required to problem solve individually and in a team and have phobias like claustrophobia and a fear of heights challenged. 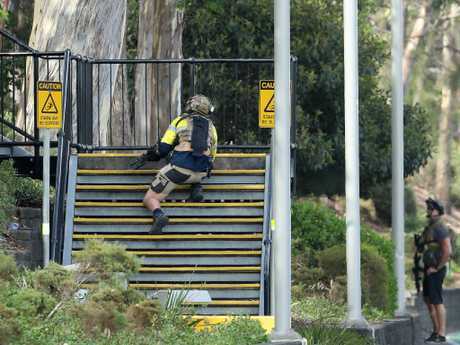 SERT officers are required to keep a high level of fitness and usually have daily personal training sessions and well as regular training scenarios to make sure they are prepared when real threats arise, such as yesterday's siege. The two suspected gunmen are set to appear in the Brisbane Magistrates Court today. The 33-year-old man has been charged with 21 offences including possession of a firearm, two counts unlawful possession of weapons, five counts each of unlawful use of a motor vehicle and stealing, three counts of burglary, two counts of break and enter and dangerous operation of a motor vehicle. The 29-year-old man has been charged with 17 offences including two counts of unlawful possession of weapons, four counts of unlawful use of a motor vehicle, three counts of stealing, three counts of burglary and two counts of break and enter.